In 2007, Andy Hamilton and Guy Jenkin debuted the family sitcom Outnumbered on British television, dumped into a 10:30 PM timeslot with minimal promotion. There was nothing about the show which seemed especially extraordinary. Claire Skinner and Hugh Dennis play a middle-class couple with three cute, but unpredictable kids. The opening scene of the pilot is a familiar scenario in which the parents scramble to get their kids ready to go to school, the mom predictably more concerned than the dad. The moment their first kid comes into the kitchen is the moment you begin to understand why this series eventually went on to run for five immensely popular, award-winning seasons. Rather than mugging for the camera or delivering punchlines like a Modern Family character, where we laugh at how the kids seem like little adults, the first kid character we see in Outnumbered has a stumbling-speech pattern and believably untrained energy. You get the distinct impression that he’s improvising his every line and the adult actors are doing their best to simply react. That’s the same philosophy and style of humor Hamilton and Jekins brought to their 2015 movie What We Did On Our Holiday. The basic plot involves a couple (David Tennant, Rosamund Pike) attempting to put their marital difficulties aside as they take their three young children to attend their grandfather’s (Billy Connolly) 75th birthday party in the Scottish Highlands. With a central trio like that – Tennant, Pike, Connolly – there’s plenty of reason to turn this into a must-watch for Doctor Who/Gone Girl/Brave fans (Tennant gets to use his actual Scottish speaking voice!). However, those three are but window dressing to the true trio at the heart of everything: The kids, played by Emilia Jones (the oldest and most mature), Bobby Smalldridge (the middle child whose obsessed with Norse gods) and Harriet Turnbull (the adorable baby of the family who says anything she wants to, and recalls Drew Berrymore from E.T. on more than one occasion). To prepare for the shoot, Tennant, Pike and the kids (with Hamilton and Jenkins along to monitor everything) actually spent a day at a waterpark together pretending to be a family, albeit one with a father swarmed by enthusiastic kids who still remember him from Doctor Who. That might be why they do genuinely seem like a family when we meet them in What We Did On Our Holiday. Ala the Outnumbered pilot, we open with the mom and dad trying to herd the kids into the car, but mostly Tennant and Pike are doing their best to not laugh at the kidspeak and kidlogic being thrown their way, such as the youngest daughter’s explanation for why they must bring her pet rock with them. It sets the tone right away. If you cannot stand cute kids saying the darndest things while adults stammer and muster some kind of response then this movie is not for you. It’s not just that the kids have the best lines. It’s also that they seem to have the most screen time. Not too long after reaching their granddad’s stately manner, they head out for a day in the countryside with him, the film only occasionally jumping back to the house to remind us that all of the adults (a group that also includes Ben Miller and Emilia Jones as Tennant’s brother and sister-in-law) are too busy arguing to have fun. It’s at this point the film takes a turn which is too big to spoil here, but the kids handle the darker material well. 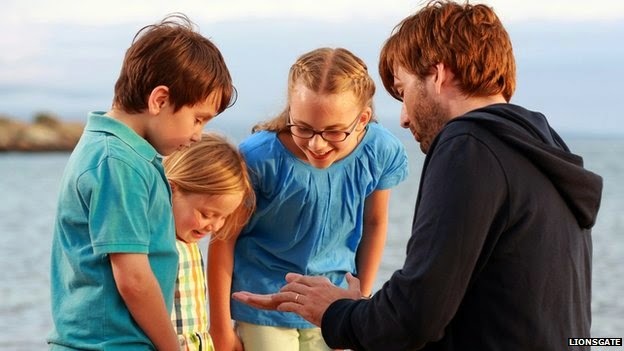 The film as a whole occasionally feels a tad sitcomy, turning into a story about the things kids can teach adults, but it’s never not fun watching actors like Tennant, Pike and Connolly reacting to little kids blindsiding them with some out-of-nowhere questions and jokes. Family entertainment best suited for fans of the main adult actors (Billy Connolly, David Tennant, Rosamund Pike) but enjoyable for anyone who has a soft spot for cute little kids saying the darndest things, especially if it’s with a British accent. Previous Entry Trailer: Hail The Coen Brothers, George Clooney & Hail, Caesar!